Now Voyager, a 1942 film directed by Irving Rapper, stars Bette Davis. The title of the film comes from Walt Whitman’s “The Untold Want,” published in Whitman’s Leaves of Grass. Whitman, in his epic masterpiece, composed of over 400 individual poems, writes “The untold want, by life and land ne’er granted,/ Now, Voyager, sail thou forth, to seek and find.” This poem is number 289 in this epic work. Leaves of Grass is Whitman’s magnum opus in which he allows the reader entrance into his thoughts on life and on sensuality. Bette Davis, in Now, Voyager plays Charlotte Vale, a woman on the verge of a nervous breakdown, in this beautifully interpreted film based on Whitman’s two-line poem. Now Voyager, is a film in which a young woman’s truculent mother, for many decades, hinders her from both self-actualization and self-expression. Charlotte Vale dresses dowdily, she wears unflattering glasses, she is called fat, she is discouraged from achieving pulchritude, she is prohibited from relationships with men, and her mother censors her books. Through her sister’s intervention, she receives help and reaches new heights, and is no longer recognizable to either her family or to her family’s friends. This film is Bette Davis at her best! (I also love The Letter, and Jezebel as well). Whitman, in this poem and in others in Leaves of Grass, uses ships metaphorically to illustrate that life was meant to sail. It was not meant to remain stagnant. Depicted in this work of poetry, Whitman realizes the importance for people to both grow and develop without constraints, and that their lives should be allowed to sail, to go places, and to experience life. As he says in “ABOARD at a Ship’s Helm, “O ship of the body-ship of the soul-voyaging, voyaging, voyaging,” we must always be sailing to seek and to find new things as well as our true selves. After one seeks and finds, what shall she do? Rapper, through this film, shows us how life can be dampened when one is not allowed the freedom of self-expression, self-actualization, and when one is made to feel like an ugly goose. Irving Rapper, the director, interprets Whitman’s poem through the illustration of Charlotte Vale. She, with the help of a psychiatrist, is treated away from her home and from her family. After the near completion of her treatment, she takes a trip that results in her character blossoming and transforming into the person that she longs to become. She sets sail to seek and to find all that her mother had heretofore denied her. Previously, all of her desires for love and for adventure had always been discouraged, and she had no access to romance and to life. Formerly, her mother, had always looked at her disdainfully, and forced her to live a staid life. Vehemently, her mother forced her to wear unattractive glasses! Charlotte Vale takes a stand and realizes that she must voyage, seek, and find. And, she does! When one is allowed to sail by experiencing life, one can see a person’s comeliness instead of his or her imperfection. Much to Charlotte’s family’s shock and her mother’s eventual chagrin, at the end of her trip, Charlotte “comes out and wants the world to know it.” She has found both temporal romance and friendship on the cruise. She finds everything that she is seeking.The scene in which Charlotte, after transformation, disembarks from the ship, illuminates Bette Davis at her best. 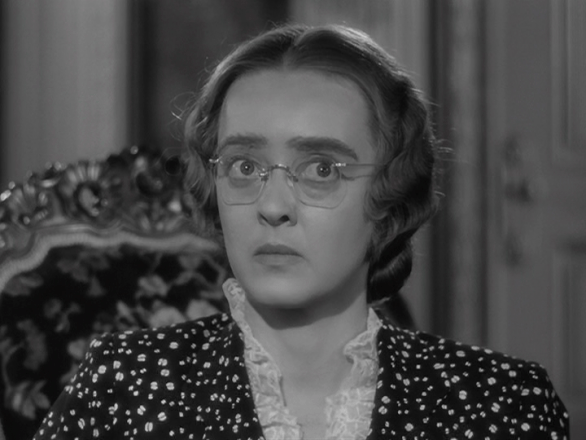 Bette Davis, as Charlotte, confidently, not diffidently, walks off the ship. People are now attracted to her. She is not only beautiful, but she is interesting! Others are attracted to her character and to her style. She neither looks, nor talks the same. Furthermore, she now has a coterie, although in theory. She wears fashionable clothing, her eyebrows are arched, she has lost twenty-five pounds, she wears makeup, and most of all, she now is armed with both less docility and greater confidence to face her mother. We are able to see Charlotte through the eyes of her friends and through her own eyes. Charlotte learns to free herself of her mother’s shackles, and the limitations that others have placed on her. Best of all, Charlotte realizes that she too has the opportunity to help someone, a child, who is now in the same predicament that she previously faced. She helps the daughter of the man whom she loves, but knows that she can not be reconciled to him. Thematically this film shines. It was relevant in 1942, and is ever more relevant today. Like Whitman said in his classic poem, “I Sing the Body Electric.” We see that everyone should be celebrated and respected without constraints, regardless of exterior features. Because of images that bombard us on television, women, young girls, men and young boys often struggle with self-image, often confusing it with body-image. A classic film, Now, Voyager, can aid many women and children who struggle to fit in society because they are not deemed classically beautiful.Through this film, both adults and children can see that they need not be bound by a family’s limitations, and despite these negative limitations, they can set sail, seek, and find that which seems out of their reach. Now, voyager, preserved by The National Film Registry, was selected by the Library of Congress in 2007 for its cultural, aesthetic and historical importance. Study some of Whitman’s poems in Leaves of Grass, and show the film alongside it to help teach some of the concepts in Whitman’s poems. Engage students in small group discussions. Additionally, a novel that can thematically foster a discussion on beauty image is Toni Morrison’s The Bluest Eye. It’s a bit complex, but if it’s taught children will grow and develop positively. I have had this film for two years. I have a collection of Bette Davis’s films, but I had not watched this one, until it was on Turner Classic Movies on September 5, 2015. I wish that it had not taken me so long to see it. I did not realize the significance of the title, until I watched the film!